There are two ways of going from Athens to Delphi: by sea from the Piraeus to Itea and thence by carriage or by motor. Despite the rough surfaces of the roads and the terrors of dust, I chose the latter; and I was well rewarded. For the drive is a glorious one, though very long and fatiguing, and it enabled me to see a grand monument which many trav­elers miss—the Lion of Chaeronea, which gazes across a vast plain in a solitary place between Thebes and Delphi. Leaving Athens early one morning, I followed the Via Sacra, left Eleusis be­hind me, traversed the Thriasian plain, the heights of Mount Geraneia, and the rich cultivated plain of Boeotia, passed through the village of Kriekouki, and ar­rived at Thebes. There I halted for an hour. After leaving Thebes, the journey became continually more and more inter­esting as I drew near to Parnassus: over the plain of Livadia, through the village and khan of Gravia, where one hundred and eighty Greeks fought heroically against three thousand Turks in 1821, over the magnificent Pass of Amblema, across the delightful olive-covered plain of Krissa, and up the mountain to Delphi. Throughout this wonderful journey, during which I saw country alternately intimate and wild, genial and majestic, and at one point almost savage, I had only one deception: that was on the Pass of Amblema, which rises to more than eight thousand feet above the level of the sea. Delphi, I felt, ought to be there. Delphi, I believed, must be there, hidden some­where among the rocks and the fir-woods, where wolves lurk, and where the eagle circles and swoops above peaks which are cold and austere. Only when we began to descend in serpentine curves, when I saw far below me great masses of olive-trees, and, beyond, the shining of the sea, did I realize that I was mistaken, and that Delphi lay far beyond, in a region less tragically wild, more rustic, even more tender. During this journey of, I believe, about three hundred kilometers or more, I real­ized fully the loneliness that happily shad­ows a great part of Greece. We seemed to be almost perpetually in the midst of a delightful desolation, gloriously alone with nature, now far up on bare flanks of the hills, now traveling through deserted pine­woods or olive-groves, now upon plains which extended to shadowy ranges of mountains, and which here and there re­minded me of the plains of Palestine. Strange it seemed to come upon an occasional village of Greeks or Albanians, strayed, surely, and lost and forgotten in the wilderness; stranger still to see now and then some tiny Byzantine church, perhaps with a few cypresses about it, perched on a mountain height that looked as if it never had been trodden by foot of man. The breezes that met us were alive with a tingling purity of hilltop and sea, or sweet and wholesome with the resinous odor of pine. And the light that lay over the face of the land made nearly all things magical. Again we met Turkish Gypsies. In Greece they have made the wild life their own. No longer one hears of brigands, though only a few years ago these high­ways were dangerous, and men traversed them armed and at their own peril. 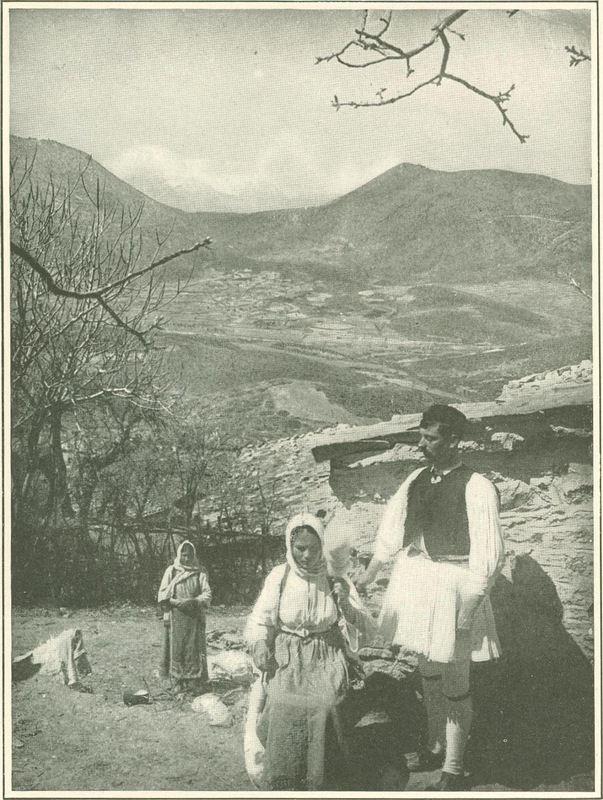 Now the Gypsies are in happy possession and travel from place to place in small caravans, with their mules, donkeys, and dogs, and their tiny peaked tents, telling the bonne aventure to the superstitious, and, so the Greeks declare, stealing what­ever they can lay their dark hands on. They look wild and smiling, crafty rather than ferocious; and they greet you with loud cries in an unknown tongue, and with gestures expressive of the perpetual desire to receive which seems inherent in all true vagabonds. They pitch their tents usually on the outskirts of the villages, staying for days or weeks, as the luck serves them. And, so far as I could judge, people receive them with good nature, per­haps grateful for the excitement they bring into lives that know little variation as sea­son follows season and year glides into year. Just outside Thebes I found eleven of their tents set upon some rough ground, the beasts tethered, the dogs on guard, the babies toddling and sprawling, while their mothers were cooking some mysteri­ous compound, and the men were away perhaps on some nefarious errand among the excited Thebans. For that day Greek officers were visiting the town, and in front of the cafe, among the trees, and above the waterside, where we stopped to lunch, there was a parade of horses, mules, and donkeys from all the neighborhood. War was taking its toll of the live-stock, and the whole population was abroad to see the fun. As soon as I had descended from the car and begun to unpack my provisions, an elderly man came up, asked whether we were from Athens, and then put the question that is forever on the lips of the Greek, "What is the news?" Every Greek has a passion for the latest news. Often, when I was traveling through the country, people I passed on the way called out to me, "What is the news?" or, "Can you give us a newspaper?" Thebes, where, according to legend, Hercules was born; where the stones gath­ered themselves together when Amphion struck his lyre; where blind Tiresias prophesied; and, seated upon a block of stone, the Sphinx asked her riddle of the passers-by and slew them; where Oedipus ruled and suffered his hideous fate; where the Epi­goni took their vengeance; and Epaminondas showed how one man can lift a city and set it on a throne above all the cities of its fatherland—Thebes, where letters were first brought into use among the Greeks, and where weak-voiced Demos­thenes by his eloquence persuaded the peo­ple to march to their glorious death against Philip of Macedon, is now just a busy village on the flank of a hill. Frequently devastated by earthquakes, which are the scourge of this region, it looks newly built, fairly clean and neat. It dominates the plain in which Plutarch was born, and the murmur of its waters is pleasant to the ear in a dry and thirsty land. But though Thebes is not especially interesting, below it, in that plain once celebrated for its flowers,—iris and lily, narcissus and rose, —beyond all sound of the voices of chatter­ing peasants or determined soldiers, solitary in its noble rage and grief, is that most moving of monuments, the Lion of Chaeronea. I came upon it unexpectedly. If I had not happened to be looking toward the left my chauffeur would have driven me on without pause to Parnassus, the mighty flanks of which were already visible in the distance. When he pulled up we were already almost out of sight of the lion. And I was glad as I walked back alone, still more glad when I stood before it in solitude, surrounded by the great silence of the plain. There where the lion sits, raised now on a high pedestal and with cypresses planted about him, was fought the great battle of Chaeronea between the Greeks and Philip of Macedon; and there the Greeks lost much, but not their honor. Had it been otherwise, would the lion be there now after so many centuries, testify­ing to the grief of men long since dead, to their anger, even to their despair, but not to their cowardice or shame? I have heard people say that the face of the lion does express shame. It seems to me nobly passionate, loftily angry and sad, but not ashamed. The Thebans raised it to commemorate those of their comrades in arms who died on the battle-field. What shame can attach to such men? For long years the lion lay broken in pieces and buried in the earth. Only in 1902 were the frag­ments fitted together, though long before that they had lain above ground, where many noted travelers had seen them. The restoration has been splendidly successful, and has given to Greece one of the most memorable manifestations in marble of a state of soul that exists not merely in Greece, but in the world. Lion-hearted men are superbly commemorated by this lion. The height of the statue from the top of the pedestal is about twenty feet. The material of which it is made, marble of Boeotia, was once, I believe, blue-gray. It is now gray and yellow. The lion is sit­ting, but in an attitude that suggests fierce vitality. Both the huge front paws seem to grasp the pedestal almost as if the claws were extended in an impulse of irre­sistible anger. The head is raised. The expression on the face is wonderful. There is in it a savage intensity of feeling that is rarely to be found in anything Greek. But the savagery is ennobled in some mysteri­ous way by the sublime art of the sculptor, is lifted up and made ideal, eternal. It is as if the splendid rage in the souls of all men who ever have died fighting on a losing side had been gathered up by the soul of the sculptor, and conveyed by him whole into his work. The mysterious human spirit, breathed upon from eternal regions, glows in this divine lion of Greece. 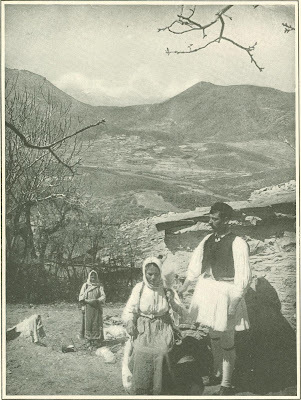 Various writers on the scenery of Greece have described it as "alpine" in character. One has even used the word in connection with some of the mountain-ranges that may be seen from the plain of Attica. Such distracting visions of Swit­zerland did not beset my spirit as I trav­eled through a more beautiful and far more romantic land, absolutely different from the contented little republic which has been chosen by Europe as its play­ground. But there were moments, as we slowly ascended the Pass of Amblema, when I thought of the North. For the delicate and romantic serenity of the Greek landscape did here give way to something that was almost savage, almost spectacular. The climbing forests of dark and hardy firs made me think of snow, which lies among them deep in winter. The naked peaks, the severe uplands, the precipices, the dim ravines, bred gloom in the soul. There was sadness combined with wildness in the scene, which a premature darkness was seizing, and the cold wind seemed to go shivering among the rocks. It was then that I thought of Delphi, and believed that we must be nearing the home of the oracle. As we climbed and climbed, and the cold increased, and the world seemed closing brutally about us, I felt no longer in doubt. We must be close to Delphi, old region of mysteries and ter­ror, where the god of the dead was thought to be hidden, where Apollo fought with Python, where men came with fear in their hearts to search out the future. But presently we began to descend, and I learned that we were still a long way from Delphi. The sun set, and evening was falling when we were once more down on the sea-level, traversing one of the most delightful and fertile regions of Greece, the lovely plain of Krissa, which extends to the sea. The great olive-gardens stretch away for miles on every hand, interspersed here and there with plane-trees, mulberry-trees, medlars, cypresses, and the wild ole­ander. Many battles have been fought in that sylvan paradise, which now looks the home of peace, a veritable Garden of Eden lying between mountains and sea. Pil­grims traveling to Delphi were forced to pay toll there, and eventually the extor­tion became so intolerable that it led to war. That evening, as we drove along a road cut straight through the heart of the olive-woods, the whole region seemed sunk in a dream. We met no one; we heard no traffic, no voices, no barking of dogs. The thousands of splendid trees, planted sym­metrically, were moved by no breeze. Warmth and an odorous calm pervaded the shadowy alleys between them. Here and there a soft beam of light shone among the trees from the window of a guardian's dwelling. And once we stopped to take Turkish coffee under a vine-trimmed ar­bor, solitary and lost in the sweet silence, in the silver dusk of the forest. A lodge in the wilderness! As I looked at the dark, bright-eyed man who served us, I, perhaps foolishly, envied him his life, his strange little home, remote, protected by his only companions, the trees. In this plain camels are used for trans­port, and, I believe, for plowing and other work. They are to be found nowhere else in Greece. I saw none that night; but one morning, after leaving Delphi, I met a train of them pacing softly and disdain­fully along the dusty road, laden with bales and with mysterious bundles wrapped round with sacking. In the dark we began to climb up once more. At last we were actually on Par­nassus, were approaching the "navel of the earth." But I was not aware of any wildness, such as that of Amblema, about us. The little I could see of the landscape did not look savage. I heard goat-bells tinkling now and then not far off. Presently some lights beamed out above us, as if in welcome. We passed through a friendly village street, came out on the mountain-side, and drew up before a long house, which stood facing what was evidently a wide view, now almost entirely hidden, though a little horned moon hung in the sky, attended by the evening star. The village was Kastri; the long house was the "Hotel d'Apollon Pythien." Delphi is memorable, but not because of wildness or terror. In retrospect it rises in my mind as a lonely place of light, gleaming on volcanic rocks and on higher rocks that are gray; of a few mighty plane-trees, pouring a libation of green toward olive-trees on the slopes beneath them; of a perpetual sweet sound of water. And beside the water travelers from the plain of Krissa, and travelers from Arachova, that wonderfully placed Parnassian vil­lage, renowned for its beautiful women, are pausing. They get down from their horses and mules to lave their hands and to drink. They cross themselves before the little Christian shrine under the trees by the roadside. They sit down in the shadows to rest. It is very sweet to rest for long hours by the Castalian fountain of Delphi, re­mote from all habitations upon the great southern slope of Parnassus, under the tree of Agamemnon; to listen to the voice of the lustral wave. There, in the dead years, the pilgrims piously sprinkled them­selves before consulting the oracle; there, now, the brown women of the mountains chatter gaily as they wash their clothes. The mountain is bare behind the shrine, where perhaps is a figure of Mary with Christ in her arms, or some saint with outspread wings. Its great precipices of rock are tawny. They bloom with strong reds and yellows, they shine with scars of gold. Among the rocks the stream is only a thread of silver, though under the bridge it flows down through the olive-gardens, a broad band of singing happiness. Delphi has a mountain charm of re­moteness, of lofty silence; it has also a seduction of pastoral warmth and gentleness and peace. Far up on the slope of gigantic Parnassus, it faces a narrow val­ley, or ravine, and a bare, calm mountain, scarred by zigzag paths, which look al­most like lines sharply cut in the volcanic soil with an instrument. In the distance, away to the right, the defile opens out into the plain of Krissa, at the edge of which lies a section of sea, like a huge uncut tur­quoise lying in a cup of the land. Beyond are ranges of beautiful, delicate mountains. 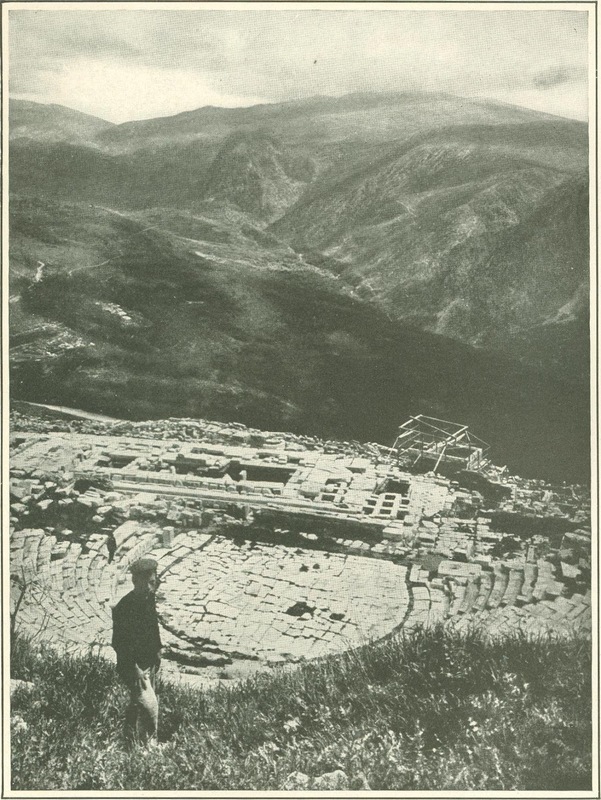 The ruins of Delphi lie above the high­road to the left of it; between Kastri and the Castalian fountain, unshaded, in a naked confusion, but free from modern houses and in a fine loneliness. At one time, and not very long ago, the village of Kastri stood close to the ruins, and some of it actually above them. But when ex­cavations were undertaken seriously, all the houses were pulled down, and set up again where they stand today. Like the ruins at Eleusis and Olympia, the remains at Delphi are fragmentary. The ancient Hellenes believed, that the center of the earth was at a certain spot within the Temple of Apollo at Delphi, where the eagles of Zeus, flying from the two ends of the earth, had met. The foundations, and some portions of the walls of this cele­brated shrine, in which two golden eagles stood, may be visited, but very little of it remains. On the foundation has been set up a large Roman column, upon which once stood a statue. The fallen blocks of Doric columns are gigantic, and from them it is possible to gain some faint idea of the temple's immense size and mas­siveness. In the midst of a pit of stone, not far from the columns, I found a soli­tary fig-tree growing. It is interesting to notice that the huge outer wall of the tem­ple was constructed of quantities of blocks, each one differing in shape from its neigh­bors. These were ingeniously fitted close together without the aid of any joining material. Although it is impossible not to wonder at and admire the cleverness shown in this wall, it produced on my mind an impression of confusion that was almost painful. The multitudes of irreg­ular lines distressed my eyes. There is little repose in a puzzle, and this wall is like a mighty puzzle in stone. Among the masses of broken fragments which cover much of the hillside stands out a small, solid building of Parian mar­ble, very pure, very clean, almost shining under the rays of the sun. It resembles a great marble casket in which something very precious might be placed and sealed up. This is the treasury of the Atheni­ans, which has been reconstructed since Kastri was moved from the fragments of the original temple. It is, in fact, a tiny Doric temple. The marble, of a beauti­ful yellow-white color, is mingled here and there with limestone. This little tem­ple stands on a platform, with the clearly defined Sacred Way winding up the hill beside it. The front of it is approached by two steps, and it has two Doric columns, containing, however, only two blocks of the original marble, brown, with touches of old gold. The remaining blocks of these columns are of white Poros marble, brought from a distance, and they look rough and almost glaring. Poros marble may always be recognized by the minute shining grains, like specks of gold that are scattered through it. Although a fine substance, it looks vulgar when placed be­side Parian marble. The semicircular places in which the priests of Delphi used to sit may still be seen, facing a fine view. The sea is hidden by a shoulder of the mountain, but the rolling slopes beyond. the road are covered thickly with olive-trees, among which the goat-bells chime almost perpetually; and on the far side of the narrow valley the bare slopes, with their tiny, red paths, lead calmly toward rocky summits. To the left the highroad turns sharply round a rock in the direction of the Castalian fountain. In the fairly well-preserved theater to the northwest, quantities of yellow flowers were growing, with some daisies. Among the gray limestone blocks of the orchestra I found a quantity of excellent blackber­ries. Where once was the stage, there are now brown grasses dried up by the sun. This theater is very steep, and above it towers a precipice. Nearby, between the theater and the stadium, Parnassus gives back to your cry a swift and sharp echo. The gold, red-gold, and gray stadium, which lies farther up the mountain than the theater, is partly ruined, but in parts is well preserved. As I stood in it, think­ing of the intellectual competitions that used to take place there, of the poems recited in it, of the music the lyre gave forth, and of the famous Pythian games, which, later, used to be celebrated in this strange mountain fastness, I saw eagles wheeling over me far up in the blue, above the wild gray and orange peaks. In the museum, which stands in a splen­did position on the mountain-side, with a terrace before it, there are many fine things. Delphi in the time of its great­ness contained thousands of statues, great numbs of which were in bronze. Nero, Constantine, and others carried hundreds of them away. One which they left, a bronze charioteer in a long robe, faces you as you enter the museum. It is marve­lously alive, almost seems to glow with vitality. The feet should be specially no­ticed. They are bare, and are miracles of sensitiveness. 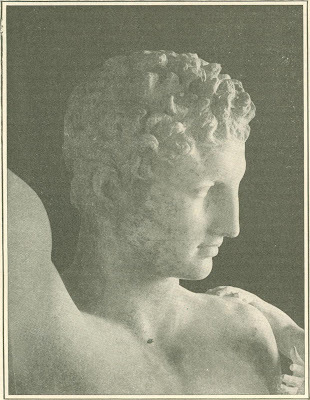 Farther on there is a splen­did Antinous, robust, sensual, egoistic, a type of muscular beauty and crude deter­mination, without heart or any sparkle of intellect. Two other statues which I thought exceptionally interesting are of a sturdy, smiling child and of a headless and armless woman. The latter, num­bered in the catalogue 1817, is very gracious and lovely. The back of the figure and the drapery, especially that part of it which flows from under the left arm. To the heel of the right foot, are exception­ally beautiful. There is a very fine view from the ter­race. Toward evening it becomes won­derfully romantic. Far off, the village of Arachova, perched on its high ridge, bounds the horizon. It is a view closed in by mountains yet not oppressive; for there is width between the two ranges, and the large volcanic slopes are splendidly spa­cious. Here and there on these slopes are large wine-colored splashes such as you see often on the mountains of Syria, and these splashes give warmth to the scene. Above the Castalian fountain the two peaks of the Phaeriadae, a thousand feet high, stand up magnificently. Between them is the famous cleft from which the cold stream issues, to flow down through the olive-groves. When evening falls, follow the winding white road a little way toward Arachova. From the soft dusk of the defile that spreads out into the plain of Krissa the goat-bells still chime melodiously. I have heard them even very late in the night. The section of sea that was turquoise now looks like solid silver. Behind it the mountains, velvety and black, flow away in delicate shapes. They are dreamlike, but beyond them rise other ethereal ranges which seem to you, as you gaze on them, impalpable, fluid almost, like a lovely im­agination of mountains summoned up in your mind. Black-green is the plain. Un­der the tree of Agamemnon glows a tiny light, like an earth-bound star. When once the pilgrims gathered who knew only the gods, Christian hands have tended the lamp before the holy picture. And a little farther on, among the foliage of the olive-trees, shines another of these Christian stars, which, in the darkness of Delphi's solitudes, shed their light, faintly perhaps, but faithfully, upon a way once often trodden by pagans who now sleep the last long sleep. To what changes in the hu­man soul do these earth-bound stars bear witness! I sat beneath Agamemnon's tree, listening to the cry of the fountain, watching the little lights, till the night was black about me. I must always think of Olympia as the poetic shrine of one of the most poetic statues in the world. 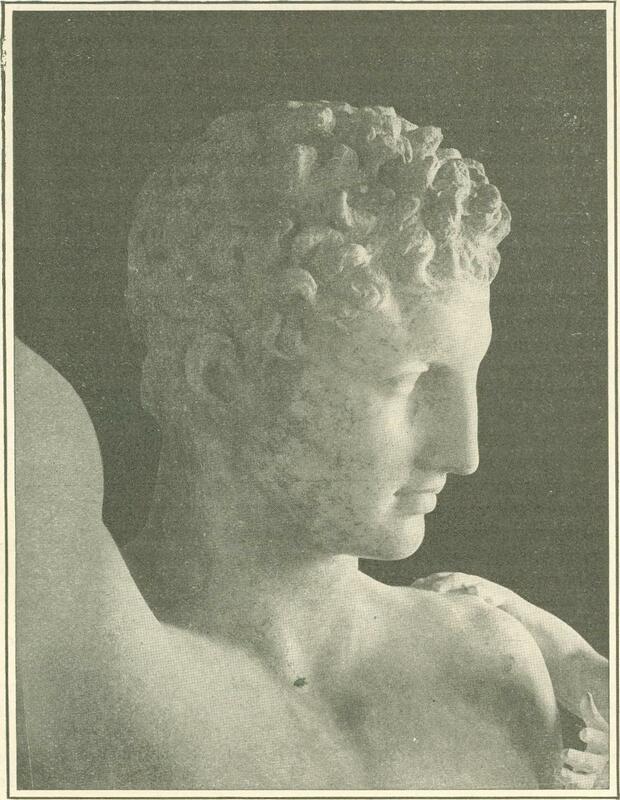 As the Parthenon seems to be the soul of Athens, so the Hermes of Praxiteles seems to be the soul of Olympia, gathering up and expressing its aloofness from all ugly things, its al­most reflective tenderness, its profound calm, and its far-off freedom from any sad­ness. When I stayed there I was the only traveler. Never did I see any human being among the beautiful ruins, or hear any voice to break their silence. Only the peasants of that region passed now and then on the winding track below the hill of Cronus, to lose themselves among the pine-trees. And I heard only at a distance the wonderful sound, like eternity's mur­mur withdrawn, that the breeze makes among their branches, as I sat by the pal­ace of Nero. Nature has taken Olympia into her lov­ing arms. She has shed her pine-needles and her leaves of the golden autumn upon the seats where the wrestlers reposed. She has set her grasses and flowers among the stones of the Temple of Zeus. Her vines creep down to the edge of that cup of her earth which holds gently, as a nurse holds a sleeping child, palaces, temples, altars, shrines of the gods and ways for the char­iots. All the glory of men has departed, but something remains which is better than glory—peace, loveliness, a pervading promise of lasting things beyond. Among the ruins of Nero's palace I watched white butterflies flitting among feathery, silver grasses and red gild white daisies. Lizards basked on the altar of Zeus. At the foot of the Heraeum, the most ancient temple that may be seen in Greece at this time, a jackal whined in its dwelling. Sheep-bells were sounding plaintively down the valley beyond the arch leading to the walled way by which the great stadium, where the games took place, was entered. When I got up pres­ently to stroll among the ruins, I set my foot on the tiny ruts of an uneven pavement, specially constructed so that the feet of con­tending athletes should not slip upon it. The ruins lie in a sheltered and remote valley far away from the sea, and sur­rounded by gentle hills, woods, and delight­ful pastoral country. At some distance is the last railway-station of the Peloponne­sian railway line, which connects with the main line at Pyrgos. Between the station and the low hill on which stand the hotel and the museum is strung out a small, straggling hamlet of peasants' houses. It is very difficult to realize that this remote sanctuary, hidden away in the green glades and amid the pastures of Elis, where the waters of Cladeus and Alpheus glide among reeds and rushes, was ever crowded with people from all parts of Greece; that emperors dwelled there; that there the passions of the mob were roused to intense expression; that there men gained the de­sire of their hearts or were exposed to the sneers and opprobrium of their fellows. For Olympia today looks like an ideal home for the great god Pan. I have called the ruins beautiful, and I think them so, partly because of their situation, with which they seem to me to combine harmoniously, and partly be­cause of nature's collaboration with them, which is lacking from the ruins at Eleusis and even at Delphi. At Olympia many trees grow among the remains of the tem­ples. A river runs by them. Excava­tions, though usually interesting, are often both dusty and ugly. At Olympia they are pastoral. Dryads might love them. Pan might sit happily on almost any bit of the walls and play his pipe. They form a unique sylvan paradise, full of wonderful associations, in which one is tempted to rest for hours, whereas from many ruins one wishes only to get away once they have been examined. And yet Olympia is so fragmentary that many persons are bitterly disappointed with what they find there, as the visitors' book in the little hotel bears witness. In all the mass of remains, and they cover a very large extent of ground, I think I saw only four complete columns standing. Two of these were columns of the Heraeum, in which the Hermes of Praxiteles was found lying among the remnants. They are golden-brown in color, and are of course Doric, very massive and rather squat. The tem­ple, the base of which is very clearly marked, must have looked very powerful, but, I should think, heavy rather than really majestic. I cannot imagine the wonderfully delicate Hermes standing within it. It is believed that the original columns of the Heraeum were of wood, and that when they began to rot away the stone columns were put up in their places. Much of the temple was made of brick. The Hermes stood between two of the columns. It will be evident to anyone who ex­amines carefully all that is left of the Temple of Zeus that it must have been very grand. Fragments of the shafts of its columns, which are heaped in confu­sion on the ground, are enormous. One block, which I found poised-upright on its rounded edge, was quite six feet high. This temple was made of limestone, which is now of a rather dreary, almost sinister, gray color. Exposure to the weather has evidently darkened it. The foundations are terrific. They suggest titanic prepara­tions for the bearing up of a universe of stone. 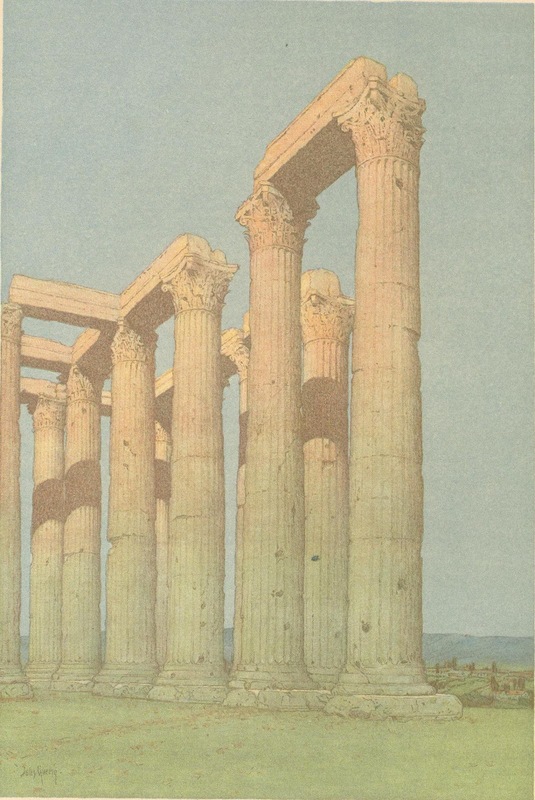 It seems to me that from what is left of this celebrated building, which stands in the middle of the sacred precinct, and which once contained Phidias's statue of Zeus, about forty feet high, one can gather something of what was the build­er's conception of the chief of all the gods of Olympus. To them he must surely have been simply the Thunderer, a deity terrific and forbidding, to whose worship must be raised a temple grand but proba­bly almost repellent. Legend relates that when Phidias had completed his great statue of Zeus, and it had been placed in position, Zeus sent down a thunderbolt which struck the ground close to the statue. The Greeks considered the thun­derbolt to be the god's characteristic ex­pression of content. Instead of the eagles of Zeus, I saw hovering over, and perching upon, this ruin black and white birds, with long tails, not unlike magpies. The statue of Zeus disappeared. It is known to have been taken to Constantinople, and in that tempestuous city it vanished, like so much else. In the time of Olympia's glory the temple was elaborately decora­ted, with stucco, painting, gilding, marble tiles, shields, and vases, as well as with many statues. But despite this, I think it must have been far less satisfying than the calm and glorious Parthenon, in which seems to dwell rather the spirit of a god­dess than the spirit of any human builders. Earthquakes are frequent at Olympia, and have been so since the most ancient times. One destroyed the greater part of Zeus's temple about four hundred years after Christ. By that time the Olympic Games had ceased to be held, and no doubt the place was beginning to fall into the neglect which, with the lapse of the cen­turies, has become so romantic. After it was forgotten by men, nature began to remember and love it. Very little of the famous stadium has been excavated. I found flocks of sheep and goats feeding peacefully above it, and near by a small, barefooted boy, with a little gun, out after quail. On the first day of my visit to Olym­pia, after spending a few hours alone among the ruins I crossed the river, where I saw some half-naked men dragging for fish with hand-nets, and mounted the hill to the museum, which looks out over the delicious valley, and is attended by some umbrella-pines. It was closed, but the keeper came smiling from his dwelling close by to let me in. He did not follow me far, but sat down in the vestibule among the Roman emperors. On my right I saw the entrance to what seemed a small gallery, or perhaps a series of small rooms. In front of me was a large, calm, well-lighted hall, with a wooden roof and walls of a deep, dull red, round which were ranged various objects. My eyes were attracted immediately to one figure, a woman apparently almost in flight, radiantly advancing, with thin dra­peries floating back from an exquisitely vital form—the celebrated "Victory" of Paeonius, now more than two thousand years old. Beyond this marvel of sug­gested motion I saw part of another room very much smaller than the hall and ap­parently empty. It drew me on, as in certain Egyptian temples the dim holy of holies draws the wanderer onward with an influence that may not be resisted. I took no more heed of the "Victory," of Hercules winning the apples of the Hes­perides, or of anything else, but walked forward, came into the last room, and found myself alone with the Hermes of Olympia. The room in which the Hermes stands alone save for the little child on his arm is exactly opposite the distant entrance of the museum. The keeper, when letting me in, had left the big door wide open. In my heart I thanked him, but not at that moment, for just then I did not notice it. I was looking at the Hermes. A great deal of sad nonsense is talked in our day by critics of art, music, and literature about "restraint." With them the word has become a mere parrot cry, a most blessed word, like Mesopotamia. They preach restraint very often to those who have little or nothing to restrain. The result is nullity. In striving to be­come "Greek," too many unhappy ones become nothing at all. Standing before the Hermes of Olympia, one realizes as never before the meaning, the loveliness, of restraint, of the restraint of a great genius, one who could be what he chose to be, and who has chosen to be serene. This it is to be Greek. Desire of anything else fails and lies dead. In the small and silent room, hidden away from the world in the green wilderness of Elis, one has found that rare sensation, a per­fect satisfaction. Naked the Hermes stands, with his thin robe put off, and flowing down over the trunk of a tree upon which he lightly leans. He is resting on his way to the nymphs, but not from any fatigue. Rather, perhaps, because he is in no haste to resign his little brother Dionysus to their hands for education. Semele, the mother, is dead, and surely this gracious and lovely child, touching because of his innocent happiness, his innocent eagerness in pleasure, looks to Hermes as his protector. He stretches out one soft arm in an adora­ble gesture of desire. The other clings to the shoulder of Hermes. And Hermes watches him with an expression of divine, half-smiling gentleness, untouched by sadness, by any misgiving, such as we often feel as to the future of a little child we love; Hermes watches him, contemplative, benign, celestial. There is a pause in the hurry, in the sorrow, of this travailing world; there is a hush. No more do the human cries sound in the midst of that darkness which is created by our misunderstanding. No longer do the frantic footfalls go by. The golden age has returned, with its knowledge of what is not needed—a knowledge that we have lost. 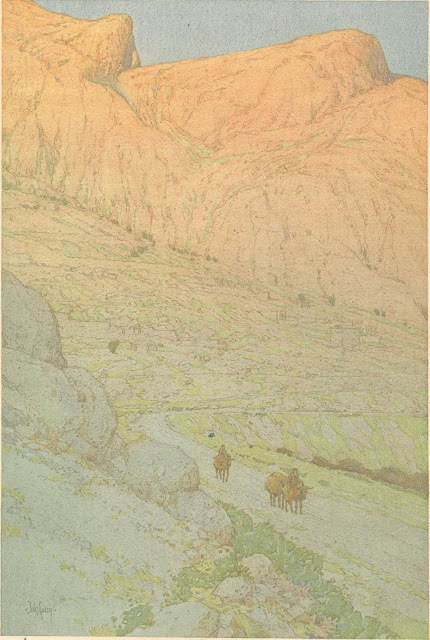 I looked up from Hermes and the little brother, and, in the distance, through the doorway of the museum, I saw a tiny pic­ture of Elis bathed in soft, golden light; a calm hillside, some green and poetic coun­try, and, in the foreground, like a message, a branch of wild olive. That is what we need, what secretly we desire, our branch, perhaps our crown, of wild. olive. And all the rest is as nothing. From The Century Magazine – June 1913.